Dr. Andringa specializes in all aspects of governance and the relationship between boards and their chief executives. He has been a governance consultant for over 30 years with broad experience in both nonprofit and academic organizations. Included in his client list are more than 65 colleges and universities and 200 nonprofit organizations, most in the faith-based sector. Bob served as the Minority Staff Director of the U. S. House Education and Labor Committee, senior policy advisor to the Governor of Minnesota, CEO of the Education Commission of the States, and President of the Council for Christian Colleges & Universities. Dr. Andringa has served on numerous national and international boards and advisory councils. He chaired the National Advisory Committee on Institutional Quality and Integrity for the U.S. Department of Education and has authored several books and articles. Bob continues consulting via "TheAndringaGroup.com." 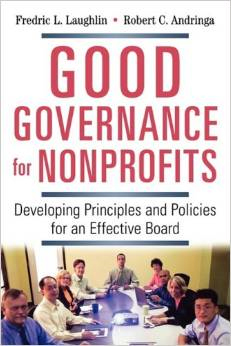 This is a must-have book for nonprofit senior staffs as well as for volunteer board members who aspire to leadership and stewardship of the organizations they serve. 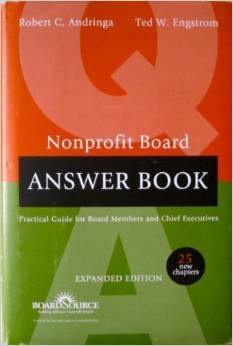 It definitely lives up to the promise of the assertion on the book jacket that the authors, "... collectively have more than 70 years of experience as chief executives, board members, and facilitators in the training of more than 20,000 board members in 20 countries..."
Many nonprofits are reluctant to develop a policies manual, believing that it takes far too much time, effort, and expertise. But the lack of responsible policies and governance can actually end up costing an organization much more in the long run -- both in reputation and in resources. This book will help organizations develop a board that is legally and ethically responsible and effective in advancing their needs.